There was a time when most rescuers, including me, refused to adopt out cats during the holidays. Are cats good Christmas gifts? We thought not. We worried that life in a new home at Christmas would be too stressful for the cat. And we feared the cat would be an “impulse buy,” like a fabulously expensive toy or flat screen TV. To be honest, I still worry about those things. If you asked me if cats are good Christmas gifts, I’d say no. If you’re thinking about giving a cat as a Christmas gift, here are some things to keep in mind. Christmas cats don’t necessarily have to arrive right on Christmas, and putting off the new family member’s arrival until after the holidays will be less stressful for everyone, including the cat. If you’re adopting from a no-kill rescue, they’ll probably be happy to keep the cat for you until the holidays are over. When it comes to new family members, surprises are never good. Make sure everyone wants a cat. And involve everyone in choosing the cat you’ll adopt. Different cats appeal to different people. And one of the joys of living with a cat is that first meeting, when you decide you really do love each other. Give the entire family the joy of sharing that experience. Wrap some cat toys and put them under the tree. Save the wrapping paper for kitty to play with when she comes home! A framed picture of your new cat can go under the tree, too. Other kitty items to wrap and put under the tree include a comfy cat bed, dishes and “how to” books about cats. 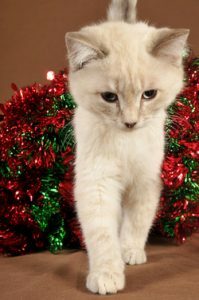 A Word About Christmas Kittens – Please Adopt Two! Kittens need to grow up with other kittens to be well adjusted, healthy and well socialized. And just one kitten who only wants to play nonstop can be annoying and destructive. Something else to keep in mind: Kittens can be annoying and even frightening to older cats. They can also be frightening to very young children because they tend to bite and scratch. And young children can injure a tiny kitten by hugging too hard. If you want a kitten, adopt two! And if you already have an adult cat or young children, a cat who’s all grown up will be a much better choice for your family than a kitten or two.